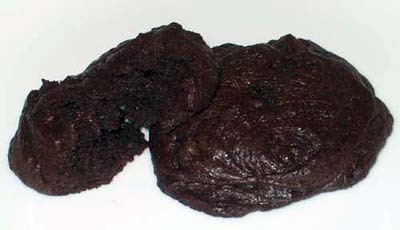 Bittersweet Chocolate Chunk Cookies can be made with chocolate chunks or chocolate chips. They are very rich and best served when completely cooled and set. Place chocolate and butter in microwave and melt on high for 1 1/2 minutes, stopping every 30 seconds to stir. Allow chocolate to cool slightly. In a small bowl, mix flour, cocoa powder, baking powder and salt; set aside. In a mixing bowl, beat eggs, sugar and vanilla until pale yellow and slightly thickened, about 5 minutes with an electric mixer. Fold the melted chocolate into the egg mixture until blended, then stir in the flour mixture. If mixture is still slightly warm and too loose to scoop (which it probably will be), put it in the refrigerator for about 20 minutes to cool and thicken. I almost always have to do this. When mixture is cool and just thick enough to scoop, stir in the chocolate chips or chunks. Drop dough onto a foil-lined plate or tray using rounded tablespoons. You should get about 18. Chill the shaped mounds until they are a bit firmer, then roll them into tight balls. Chill until ready to bake. Preheat oven to 350 degrees. Line a baking sheet with two layers of regular or heavy duty (not non-stick) foil. You may use a Silpat or parchment, but the cookies may spread more. Set the cold balls of dough on the foil lined baking sheet and bake at 350 for 12 to 14 minutes until cookies are set. Let cool directly on the foil lined baking sheet. Carefully remove from foil or transfer the sheet of foil with the cookies still stuck on it to a freezer and let them firm up before you peel them off. Once set, these are delicious, soft and fudgy cookies.